Smug declarations aside, I’m pretty happy with today’s programs. Hands down, it was one of the BEST blog events of 2008. WordPress is something all the participants were passionate about, and you can really see how much bloggers are interested in learning more about this powerful blogging platform. There was an eclectic mix of participants – newbies, probloggers, personal bloggers, developers, designers. 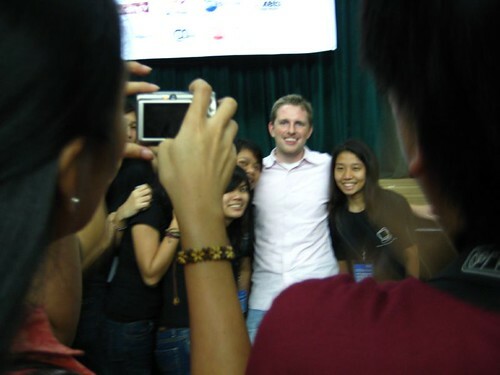 All the breakaway sessions were well attended (because they’re all interesting), and the afternoon’s plenary session was especially interesting because it was when Matt Mullenweg delivered his State of the Word address and had a short Q&A session with the campers. I think Matt was amused at how we love to take photos and took plenty of shots of campers taking a picture of him. Then there was the serious business of camwhoring after the program We all posed for a class picture with Matt, then the Wordcamp organizers and volunteers had their photos taken with the huge backdrop. Then comes the jumpshots. Matt was so amused by all of it, that he had to join the other photographers in taking photos and joining the organizers eventually. Almost everybody wanted a photo with Matt, and he willingly obliged to each request, even chatting up the groups who came up to him for a photo. I guess that’s one of the reasons why this was such a fun event: Matt was so easy going and friendly. Despite his popularity and status, he remains down to earth. It really was such an honor to meet a person like Matt Mullenweg. 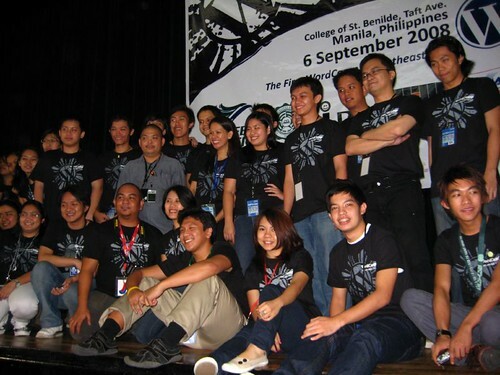 Looking forward to Wordcamp Philippines 2009! Live Blogging from Wordcamp Philippines!